President Uhuru Kenyatta has castigated Opposition leader Raila Odinga for boycotting the October 26 repeat election. Kenya is holding the repeat poll after the Supreme Court threw out the result of an August 8 election won by the incumbent but disputed Raila. Opposition leaders said it will boycott the polls unless several demands, including the sacking of IEBC CEO Ezra Chiloba, are met. Raila has been leading the Opposition supporters in demonstrations against the IEBC saying they will be no elections on the October 26th. “Tunamwambia Wakenya wamechoka. Tukisonga mbele anaturudisha nyuma, ati Kenya hii haiwezi endelea bila yeye. My friend Kenya is not about an individual but 45 million people,” Uhuru said. 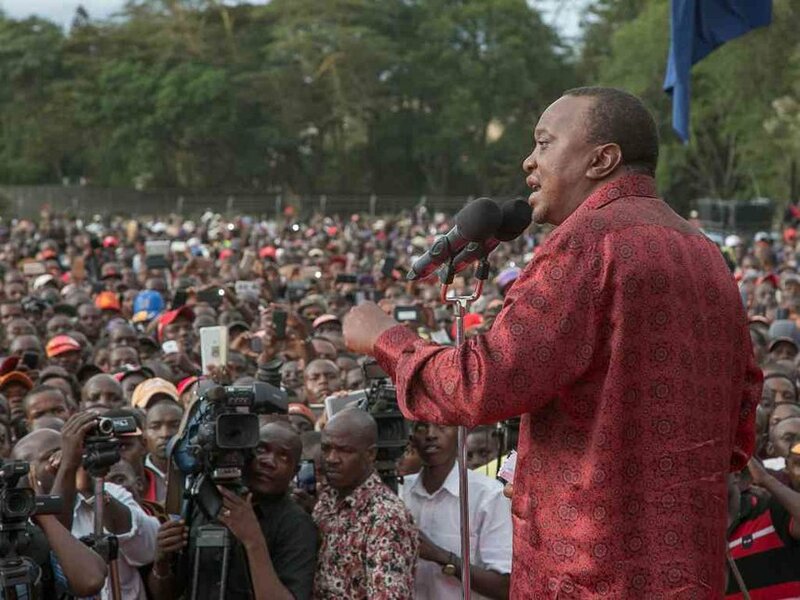 Speaking when he addressed Kajiado residents on Saturday, Uhuru said Raila has been complaining and giving out orders since the Supreme Court nulified his win. “My friend, it is not about satisfying your ego, it is not about satisfying your dream. Kama ameamua ya kwamba hautashugulika kwa uchaguzi (if you have decided not to participate in the election), we cannot continue to hold Kenya in suspense,” Uhuru said. On his part, DP William Ruto said anybody planning violent protests ahead of the elections is equivalent to a terrorist. “Anybody organising street riots where properties are destroyed over a democratic process and election officials being attacked, that is the language of terrorists,” he said. “That you plan violence in Kenya, that you want to prevent elections from happening, hiyo ni mbinu ya watu ma dictator na terrorists and it’s unacceptable,” he said. On Friday, Raila said he issue a statement on October 25 to give his supporters the way forward concerning the repeat presidential poll. Raila has reiterated that there will be no election on Thursday adding that Kenyans of goodwill must desist from participating in the elections. “On Wednesday I will talk to Kenya and I will tell you what you should do ahead of the polls,” Raila said when he addressed mourners at a funeral service in Bondo on Friday. Earlier, Uhuru said any person threatening to disrupt the presidential repeat polls next week will be dealt with according to the law. Uhuru said enough police officers have been deployed in every corner of the country to protect those willing to vote. Four people have been killed and seven arrested since the anti-IEBC protests begun but the figure is far less than the one released by Amnesty International, that placed the number of deaths to at least 33. Uncertainty over whether Raila will participate in the election and concerns that it may not proceed peacefully. The volatile build-up to the October 26 vote has revived memories for Kenyans of ethnically charged violence that killed around 1,200 people after a disputed election in 2007, when Odinga also lost and disputed the result.